Last month, we reviewed the Skip Barber Advanced Two Day Mazdaspeed Racing School at Connecticut's Lime Rock Park. Here's what they taught us. Description: The entry speed corner comes at the end of the main straight, so you want to maximize what speed you're able to gather (about 110 MPH in the MX-5) by braking as late as possible. Since the entry is very wide and the curve is relatively gentle, that means you're going to be shedding that speed while turning. Gear: Starting in 5, finishing in 3. Method: Brake gently at the last braking marker and turn in, heading in a straight line towards the apex. Now brake harder, shifting into 4th, then 3rd. Keep the car around the middle of the track as you approach turn 2. Description: A late apex in a decreasing radius corner that sets you up for a short straight leading into the following corner. Method: turn in late, lift slightly to tighten your line and hold the car against the curb to the point where it ends, then let the car track out to the left. You need to be at wide open throttle to maximize the short straight. If you do it right, you'll bounce off the limiter a few times, but changing up a gear, then down again for the next corner probably won't save any time unless you're very fast. Description: As the name suggests, the only left hander at Lime Rock. Deceptively long, there's a couple of usable lines through it, but either way you need to be able to get all the way to the left of the track on the exit to set you up for the next corner. Method: Enter in the middle of the track, trail braking as you turn slightly. Once you can see the apex, turn in sharply, clip it, but hold the wheel to left as you use the throttle to exit. You need to hit the turn in point for Turn 4 all the way to driver's left. Description: A fairly standard right hander that sets you up for the following series of slight bends known as "No Name Straight." Method: A basic corner with a textbook approach: just turn in all the way over at driver's left shift into 4th, clip the curbing at the apex and track out. Get the throttle fully open as soon as you're in 4th. Straight line the straight as much as possible, no need to hit curbs or anything. Description: A fairly straightforward right hander that's been made complicated by sticking a steep hill in the middle. If you don't have your wheel straight when you crest it, you'll spin and the barriers are very close to the track. Method: Brake lightly at brake maker 4, then turn in at marker 1. Clip the apex and get on full throttle pointed out towards the curb halfway up the hill on driver's left, then once you hit that hill use the compression to tighten your line the rest of the way. Hands straight as soon as you've done that and hug the edge of the track over the crest and down the short straight. It's easier than it looks. Description: A right hand sweeper that can be taken very fast. The inside curbing is very tall, so get close, but don't clip it. Sets you up for The Downhill, which is super important to lapping quickly, so the exit is all important here. Method: Brake lightly, then turn in for a normal apex, get fully on the throttle early and hold it there as you ride the curbing on the outside. 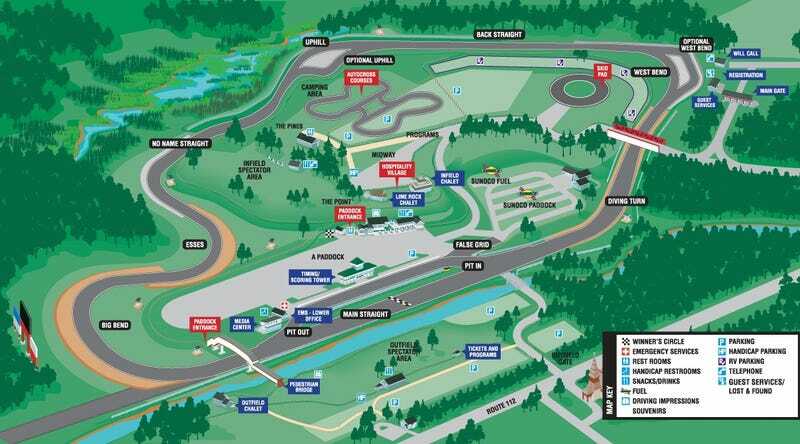 Description: If you're going to crash at Lime Rock, it'll be here. A very fast downhill right hander with compression on the entry that aids turn in. Sets you up for the main straight, you'll lose lots of time if you don't get this corner right. Gear: Start in 4, finish in 5. Method: Very confident drivers only need to lift slightly down the hill in the MX-5, but I still brush the brakes a little for some added confidence. Make sure you're on maintenance throttle at turn in, which is just where the hill flattens out. You need to use the compression this transition creates to maximize front end grip on turn in, so predict where its going to happen and turn in aggressively just as the front suspension compresses. Roll on the throttle as you clip the apex, getting it fully open as soon as possible, then track out fully the left, shifting into 5th when revs dictate. Huge the left side of the track all the way down the straight. Here I am trying to put what I learned into practice. The cars are Mazda MX-5 Cup racecars. Over the standard vehicle, they add a $5500 Mazda racing package that includes a new intake and exhaust, boosting power from 167 to 200 HP. There's also remote reservoir Eibach dampers, considerably stiffer Eibach springs, solid antiroll bars, racing brake pads and 225/45WR-17 tires. The cars are also stripped of their interiors and soft tops, have a full cage welded in and you sit in racing buckets with five-point harnesses facing a removable wheel. The whole thing weighs just 2,600 Lbs. In short, it's a real race car with much improved throttle response, steering and outright grip. It's an extremely neutral car that'll understeer if you push it too fast into corners and let you tighten your line if you lift the throttle, making it near perfect to learn on.